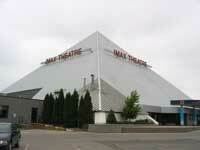 The IMAX Theatre in Niagara Falls has been entertaining visitors for many years. It has just undergone a 3 million dollar renovation, adding the new Daredevil Gallery Museum and one of only 3 National Geographic Gift stores in the world. Now Playing The Falls Movie: Niagara: Miracles, Myths and Magic. Travel back in time for a glimpse of Niagara Falls 12,000 year history and experience. The Falls Movie: Niagara: Miracles, Myths and Magic is also shown in Japanese. Fun IMAX Facts: The Screen is 4500 times bigger than the average tv screen. The screen is over 6 stories high. 12,000 watt digital surround sound brings all the sound and excitement to this 620 seat auditorium. Light from the 15,000 watt lamp in a IMAX projector is so bright, that if it were on the moon, we could see it from earth with the naked eye. If a large log were held in front of the light beam from the projector, it would spontaneously combust. Sonics Proportional Point Source(TM)(PPS) loudspeaker system was specifically designed for IMAX theatres. The system typically uses 44, laser focused speaker drivers located throughout the theatre to fully envelope the audience. A typical 45 large-format 2D film from IMAX is 3 miles long or 15,840 feet long. Family Pass $49.95 CDN; includes IMAX admission for 2 adults, 2 child, 4 drinks and 2 large popcorn. Includes admission to the theatre, Free Daredevil Gallery and ride to the observation deck at the Skylon Tower located next to the theater.